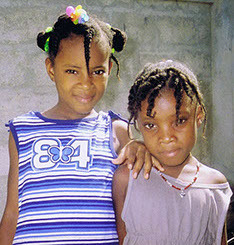 Wish For Haiti was born out of three sisters’ love for 27 orphaned children in Port Au Prince, Haiti. 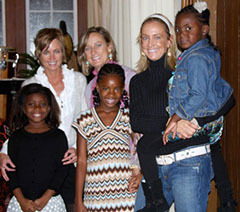 Our story begins in 2006 when one of the sisters, Gina Woodson, and her husband embarked on the process of adoption. 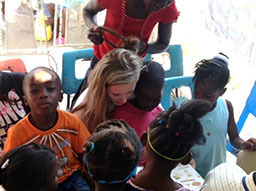 Through a friend, they learned of a priest in Haiti who had 27 children in his care. While these children were provided a better home, perhaps, than some children in Haiti, they lacked even the basics; running water, electricity, adequate food and health care, and of course, parents to tuck them in at night and provide them with the nurturing every child deserves. The sisters’ deep connection to one another led to the involvement of all three sisters and their families in Haiti. On an October day in 2006, Gina called her sister, Tracy, from Haiti asking that she might come to stay with her for a few days while she worked on the adoption process. (Leslie, the eldest sister, had already made a trip to Haiti with Gina and had determined that she and her family would like to adopt one of the children, as well!) Two days after the phone call, Tracy was on a plane to Haiti with her oldest daughter, Brooke, then 11 years old. Tracy didn’t hesitate to consider whether she should go, neither did she research Haiti prior to embarking on the journey with her daughter. She was unaware that kidnappings were at an all time high in Haiti in 2006, that the country was very unstable, that travel was not recommended to Haiti, and that very few people in Haiti speak English. She did not know that she and her daughter would be the only Americans on the plane to Port Au Prince, that public transportation did not really exist for non Haitians, nor did she know that this trip would change her life profoundly. She only knew the desperation in her sisters’ voice and that she should go. 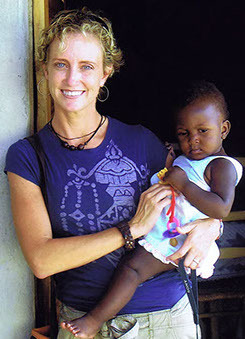 As might be expected, Tracy fell in love with the children of the orphanage and, along with her family, also resolved to adopt a child from Haiti as a result of that first trip to Port Au Prince. Some two and a half years later three of the 27 children from that orphanage were living in the United States in new homes. Now, not just roommates, but cousins. While all three sisters and their families were ecstatic about their new Haitian-born children, there remained a sadness and concern for the other 24 left behind, who had also become like family over the course of two years of adoptions and many trips to Haiti. Thus, Wish For Haiti originated. 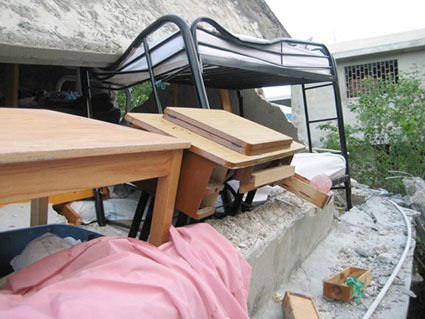 The earthquake that struck Port Au Prince in January of 2010 destroyed the new home in which the children were living. Progress had been made with regard to their living conditions and opportunities, only to be erased by that devastating day in January. Wish for Haiti concentrated much of its efforts on relocating the children to safety after the earthquake as well as providing extensive interventions for the children to promote their academic, emotional, and physical development. Since then, other organizations have also stepped in to help this group of children and they are now thriving and doing well in a newly constructed home outside of Port Au Prince. Wish For Haiti continues to support this orphanage in a variety of ways, including looking to the future for some of the older girls who are ready to venture out to live independently. Wish For Haiti is now concentrating its efforts on a newly discovered group of children that were orphaned as a result of the earthquake. In the mountains to the south of Port Au Prince in a village called Saint Rock, lives a lovely woman who had taken in some children after the earthquake. When we met them, they had been sleeping in the dirt for almost two years. Thanks to our generous donors, these children now sleep on beds with a roof over their heads and eat regular meals. We have recently constructed an additional room to provide them a covered place to eat, and modest bathroom facilities, as they had none. This orphanage has grown to 30 children and they are all now attending school and living a much more fulfilling life. Next steps include purchasing land to plant gardens and house animals, such as chickens and goats, to help the children and their care givers to be self-sustaining with regard to their food requirements. We look forward to welcoming more guests on future trips to Haiti, as this truly is a life-changing experience for all involved. Nurturing these children with food, education, experiences, and love provides the visitor the opportunity to serve and to see Christ’s face in everyone; especially the poorest of the poor. These children know they are loved and valued, and feel Christ’s presence in our connection with them.